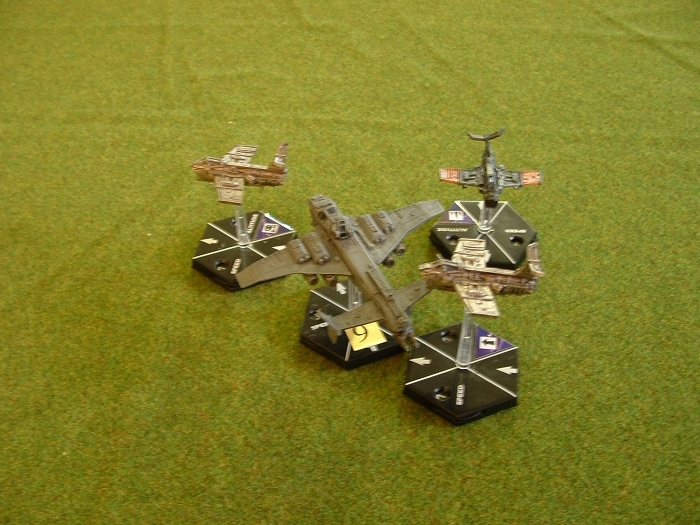 Played some more Aeronautica at the weekend, and it was lots of fun. 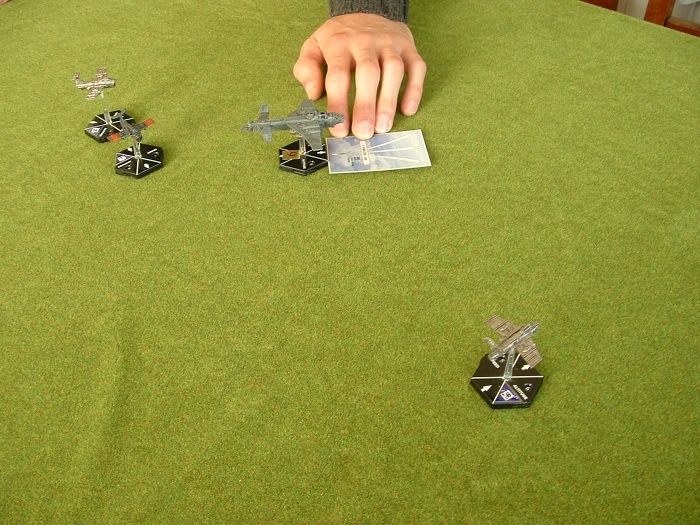 Bob came up with a simple scenario based on an event in WWII’s Pacific campaign. 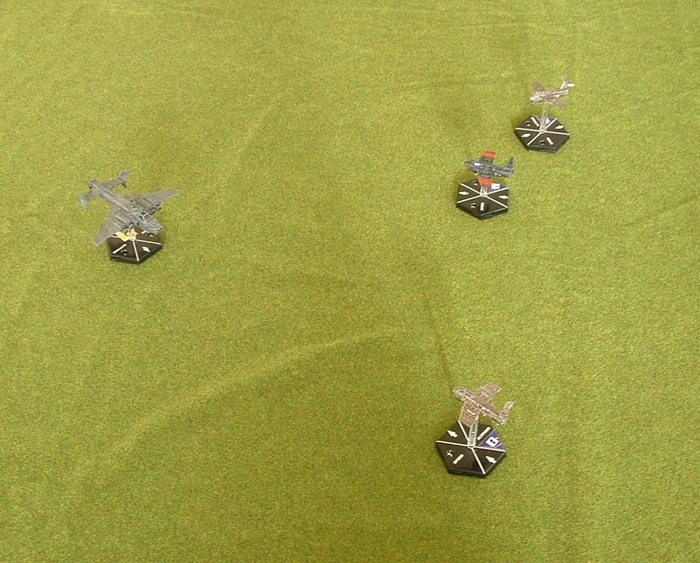 A lone, up-gunned Marauder bomber has to get the length of a 6 foot table, and 3 Ork Fightas have to stop it. It’s a variation on a scenario from the book. We ended up playing this 5 times as it was nice and fast, but still left a few tactical options to consider. Honours were fairly even, but Bob had the upper hand in the end. The first pics show me closing in on Bob’s Marauder in the first game, firing one shot as I passed and then attempting to close up form behind. The second shot is me turning to pursue and the third is Bob being wriggly. Boy, he’s an erratic flyer. It’s a long way to get down the whole board (the Marauder has a max speed of 3 in this scenario), but he managed to escape with a single wound left. Flew in at minimum height. Confused the Orks who were waiting for me to be high again, and got away easily. Tried to copy Bob’s erratic climb and dive mix and got away again with some scratches, but convincingly. Final attempt to perfect the jink and dodge method, and nearly made it. With my nose almost touching freedom, Bob had one last shot to get me before I escaped and with this final dice destroyed the Marauder. I could have been a contender. All told a jolly little scenario and very simple. Bob did point out one oddity in the rules that we might House Rule, but I’ve not read them all yet and am loathe to change things before I have a proper go through the lot. I’m sure we’ll be playing it again though. 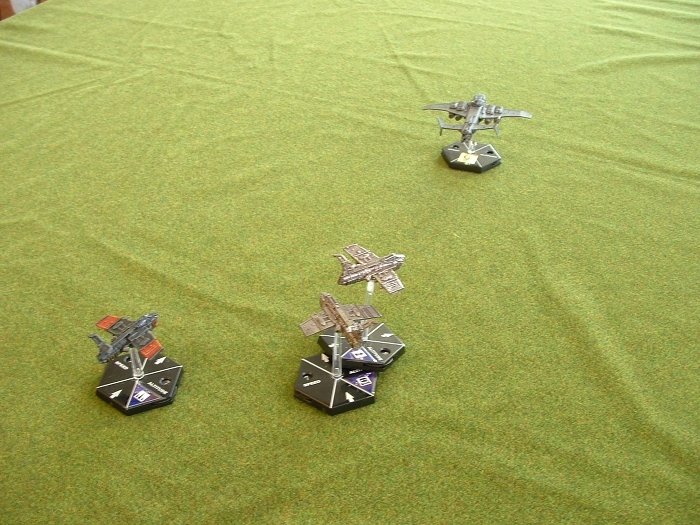 This entry was posted in Tabletop gaming. Bookmark the permalink. Yeah, you were supposed to fly it home not drive it, you sneeky bugger!!! They don’t half overdo the narration on these things. Is it just me or is there a whole load of interesting stuff they could have said but didn’t cos they were too busy telling us things like 17 to 1 odds are “unimaginable”? As someone said to me recently, those guys had such big balls that they had to build the planes that big just to fit em in!!! Funny thing is: AI is to some degrees behind technological evolution though it is a game with future figthers ;). Yeah, but being behind the curve of 21st century combat fits in with the rest of the style. The tanks are barely post WWII and a Rhino is an M113 with skulls on.